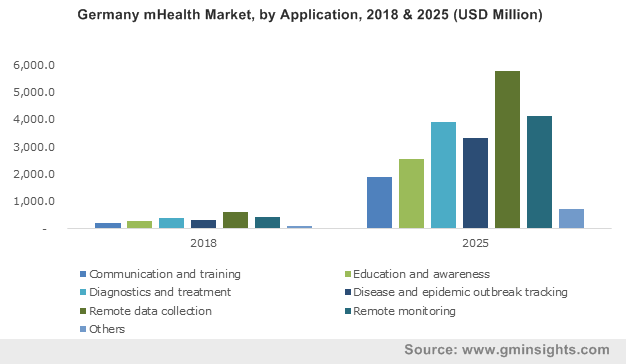 mHealth Market size was valued over USD 30.2 billion in 2018 and is expected to witness more than 38.0% CAGR from 2019 to 2025. Growing prevalence of chronic diseases such as high blood pressure, diabetes and cardiac diseases will drive mHealth market growth in the coming years. mHealth technology is viewed as a solution to improve healthcare cost efficiency as healthcare providers seek to maximize their patient outreach while minimizing costs, thus leading to industry growth. Moreover, increasing penetration of tablet and smart phones users and growing need for remote patient monitoring services will boost the market growth in the future. Growing demand for healthcare information systems and launch of new mobile applications related to mHealth technologies are the factors driving the growth of global market. According to the Centers for Disease Control and Prevention (CDC), mHealth is the practice of using mobile technologies to support public health and medicine. Hence, ease of access and mobility provided by the application of mHealth offers immense opportunities for the healthcare industry, thereby resulting into more accessible, faster, better, and cheaper healthcare solutions. 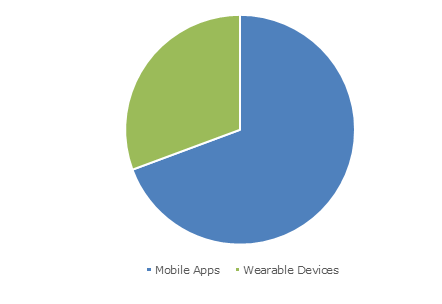 Wearble devices segment is estimated to expand at a CAGR of 39.3% over the forecast period. Factors such as effective tracking and maintaining of patient’s diet, body movements, and blood glucose levels along with improved diagnosis and treatment of various chronic disease by healthcare experts will drive the market growth during the forecast period. 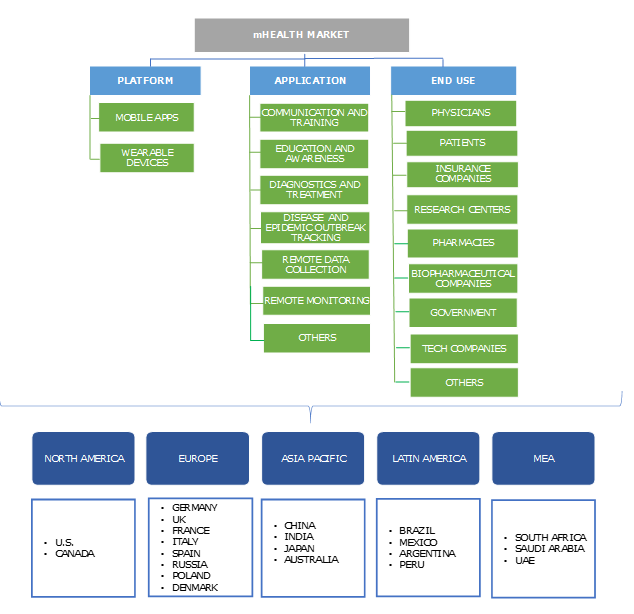 Remote data collection market segment dominated the industry, accounting for USD 7,887.3 million in 2018. The application of mHealth for remote data collection is on rise due to significant cost savings, and better job satisfaction reported by healthcare providers thereby resulting into greater efficiency and flexibility provided by the technology. The application of mHealth for disease and epidemic outbreak tracking will grow rapidly at 40.1% during the forecast timeframe. Factors such as ability of mHealth technology to quickly capture and transmit data on chronic disease incidence, that will eventually help in the prevention and containment of outbreaks will boost the market growth in the long run. Disease and epidemic outbreak tracking with the help of mHealth application is being used in various developing countries such as Peru, Rwanda, and India, thereby monitoring the spread of infectious diseases. Physician segment generated maximum revenue share in the year 2018 with a value of USD 9,097.3 million. Factors such as growing adoption of mHealth by physicians and increasing technological innovations in healthcare industry is driving the market for physicians as an end-use. Moreover, mHealth technology streamlines the healthcare system to a great extent by saving administration time of hospitals and clinics, thereby propelling the market growth. Patients market segment is expected to experience robust growth at 39.8% over the projection period. Increasing incidence of diabetes, cardiovascular diseases along with growing demand for the use of mobile applications to remain physically fit will drive the market growth amongst the patient population. U.S. market valued USD 8,057.6 million in the year 2018. Presence of large number patient pool, increased affordability in the country along with favorable government initiatives will boost the market for U.S. mHealth market. Additionally, mHealth results in maximizing healthcare expert’s time, productivity, quality, and stimulates greater consumer involvement, thereby potentially decreasing healthcare costs in the U.S.
India market is estimated to expand at a CAGR of 42.7% during the forecast timeframe. Factors such as increasing usage of smartphones and internet among the Indian population, and greater demand for easier and convenient means to receive healthcare solutions will boost the Indian market growth rapidly during the forecast period. Some of the leading key players include AT&T, Allscripts Healthcare Solutions, mQure, Apple Inc., Samsung Electronics Corporation, Omron HealthCare Inc., Philips healthcare, Bayer Healthcare, Cardionet Inc., LifeWatch AG, Masimo Corporation, Boston Scientific, Sanofi, Qualcomm Inc. and others. These companies have implemented strategic decisions such as mergers, acquisitions and partnerships to expand their product portfolio and geographic reach. Such strategic move will also help in supporting patient’s growing demands for convenient and accessible mode of treatment. mHealth industry is fragmented with number of players capturing major share in the global market. The market is anticipated to grow swiftly due to growing adoption and innovation for providing mHealth solutions, thereby, meeting consumer expectations through latest technology. Various countries are gradually adopting mHealth projects in order to save time and increase cost efficiency, coupled with better health management and information flow, therefore contributing towards the growth of mHealth market. For instance, there are more than 500 mHealth projects operating on a global level with an aim to overcome healthcare challenges around access, cost, and quality.